One of my favourite parts of buying old Warhammer materials from eBay is that you never know what you're going to find when you tear off the paper from the parcel. 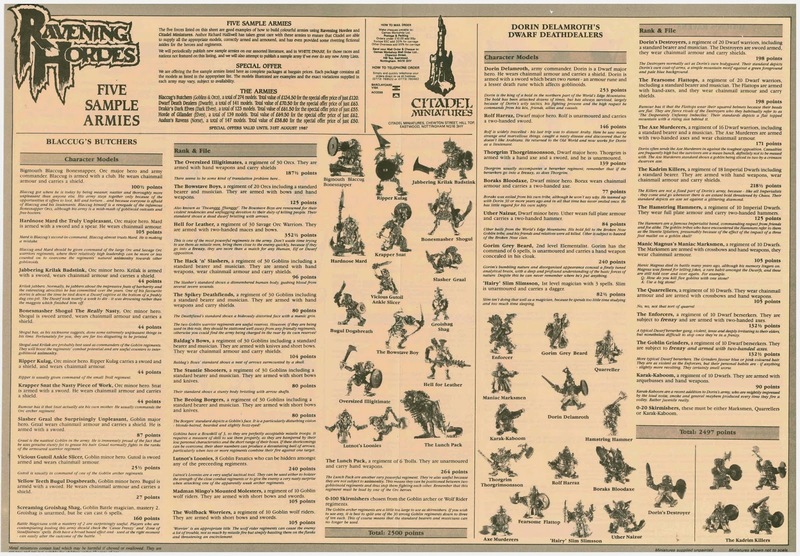 Recently I bought a near-mint boxed set of 2nd edition Warhammer, and to my delight, I discovered that it contained the rare double-sided insert from Ravening Hordes called "Five Sample Armies" (1987). The sample armies are Orcs ("Blaccug's Butchers"), Dwarfs ("Dorin Delamroth's Dwarf Deathdealers"), Norse ("Audun's Ravens"), Dark Elves ("The Dark Elves of Drakir the Destroyer") and Wood Elves ("The Royal Horde of Gilander Gulino"). 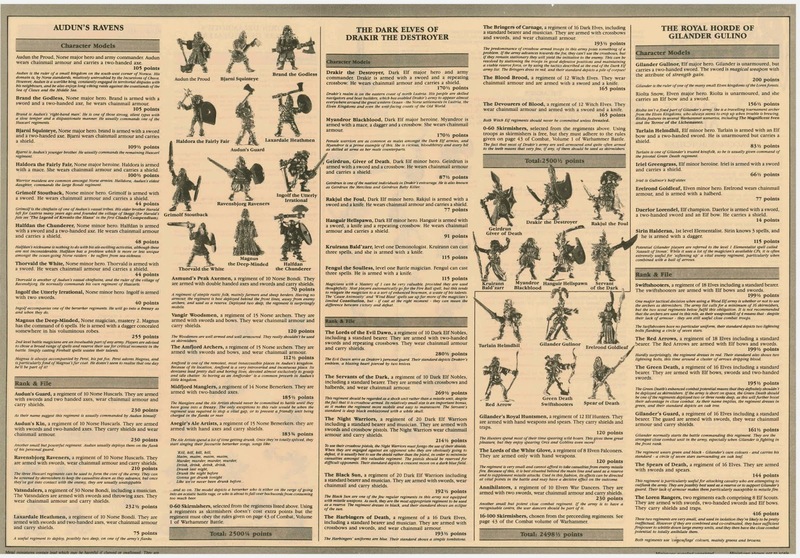 Somewhat like the old Marauder Army Deals, or the modern Saga warbands sold by Gripping Beast, this insert allowed you to buy an entire army in one go... imagine a day when you could buy 274 metal minis for £120. This slender document is special because it exemplifies how a proper army list is made (no matter what edition of Warhammer or Oldenhammer you're going to play). It's not just a ledger. Every leader and every unit in the army is given a colourful name and a spot of history to make them stand out in the imagination of the players. And yet a whole thing reads as quick as a grocery list. Like we've never been drunk before! As usual for this era of Warhammer, there's a truckload of violent alliteration ("Madman Mingo's Mounted Molesters"). I was also pleased to see that the Elven list features Riolta Snow. 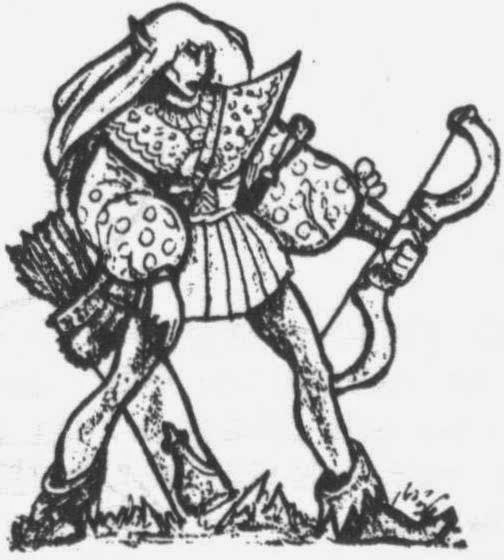 Oldenhammer fanatics will know her as the elven adventurer who pops up in other scenarios, like the Magnificent Sven and Terror of the Lichemaster. Great find, no such luck in my own copy so thanks for putting it out their for us all. I look forward to following this New world blog. Thanks Erny. I'm pretty sure Toronto was settled by Dark Elves, so I can't claim to be from one of the better parts of the New World. Nice to see another Canuck especially a Torontonian with an oldhammer blog, looking forward to whatever other treats you may have for us (ME)!